My brother-in-law Chris died recently. Chris was 74, slightly older than me, but very fit and healthy. 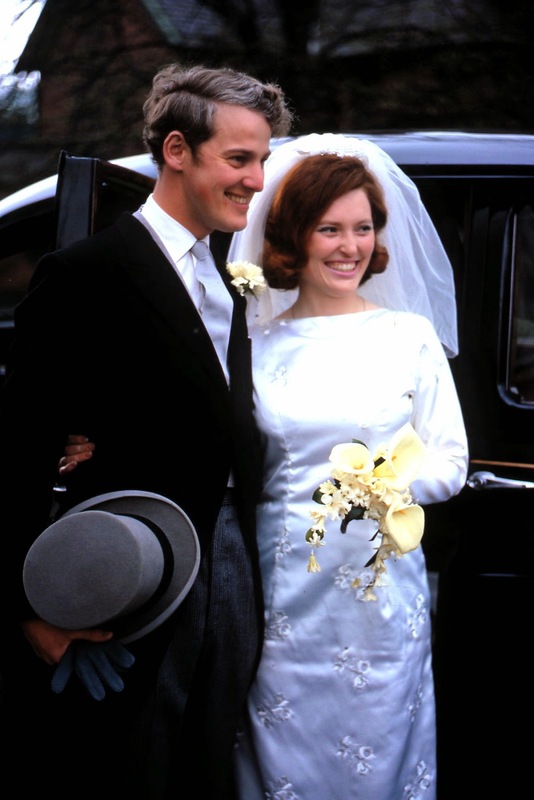 He and I married sisters, Margaret and Jennifer, and our weddings were only six weeks apart, in 1968. We both had three children. 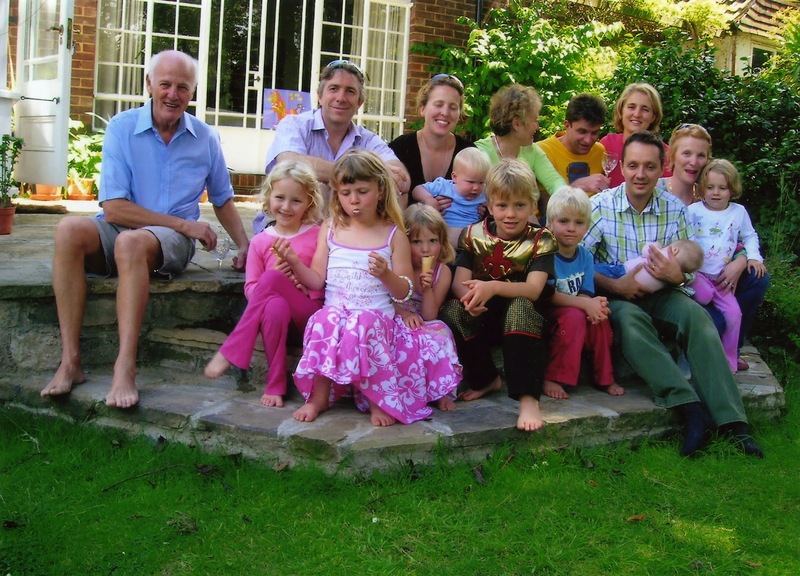 Jenny and I have six grandchildren, Chris and Margaret have nine. Our families have been very close, now in the third generation. Chris had his right knee replaced in 2009. Although it took the usual year to recover completely, it was very successful and helped him greatly. But as is so often the case the other knee caused increasing problems. He had been hobbling around for a while and the pain in his left knee was becoming worse. He decided on medical advice to have a second knee replacement. Chris was perfectly well when the operation was performed on May 22nd 2014. The operation itself was uneventful, but there was a drop in blood pressure during the procedure. This was non-specific and could have been the result of blood loss, or perhaps something else. The blood pressure recovered. For the first two days after the operation he was fine, but on the third day he was feeling ill and experiencing shortness of breath. The oxygen level of his blood was reduced and he was given oxygen by mask. On the following day he was very much worse, really fighting for breath and very distressed. He thought that he was dying. It was suspected that he might have had a pulmonary embolus, a blood clot from the leg or pelvic veins that became loose in the veins and then became trapped in the pulmonary arteries, the major arteries leading from the right side of the heart to the lungs. One of the functions of the lungs is to trap and remove blood clots from the circulation. The lungs (like the uterus) produce an enzyme, thrombokinase, that dissolves blood clots. Just a reminder of the circulation. Blood leaves the left ventricle of the heart under high pressure and it enters the aorta. It is distributed to all the body tissues and in the capillaries the pressure drops. Blood then enters the veins under low pressure. The veins from the lower part of the body come together into the inferior vena cava. This drains into the right atrium of the heart, together with the superior vena cava coming from the upper part of the body. Blood passes into the right ventricle and is then pumped, at fairly low pressure, into the pulmonary arteries. The blood at this stage has had its oxygen removed when passing through the capillaries in the tissues. The pulmonary arteries take the blood into the lungs, and in the network of capillaries the blood becomes re-oxygenated from the oxygen in inhaled air. Blood then passes out of the lungs via the pulmonary veins into the left side of the heart. 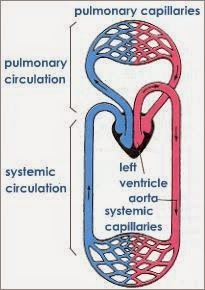 The left ventricle pumps oxygenated blood into the aorta, and so on in continuous circulation. Blood clots arising in the leg veins will enter the pulmonary veins and if they are large they will obstruct circulations with perhaps sudden death, otherwise chest pain, or shortness of breath with a failure of oxygenation of the blood. However Chris had been receiving routine anticoagulant therapy following the operation, with the purpose of preventing blood clots. CT scan of the lungs showed that there were no blood clots in the major arteries within the lungs (the pulmonary arteries). There was however a widespread abnormality within the lung tissue. The initial diagnosis was Adult Respiratory Distress Syndrome (ARDS) in a severe form, but the cause of it was not clear. ARDS is a descriptive term, the features being severe shortness of breath, low oxygen levels in the blood, and a rapidly deteriorating condition with high mortality rate. Chris’s condition was indeed deteriorating rapidly, with intolerable shortness of breath and low blood levels of oxygen despite oxygen given in high concentration by face-mask. The next step was artificial ventilation. To achieve this Chris had to be heavily sedated, effectively made unconscious, At the same time, to allow him to rest and not fight against the breathing machine, Chris had to be paralysed. This involved the injection of a derivative of curare, a poison used to tip darts by the South American “Indians”. It is usual to give this when an individual has a general anaesthetic. At the same time a breathing tube (endotracheal, ET tube) is inserted through the mouth and into the trachea. This enables ventilation directly into the lungs using high pressure oxygen. This was all achieved successfully and Chris was then stable. However this was a rescue treatment but not a treatment of the underlying disease process. But here was the problem: what was the underlying disease process? What had gone wrong? The supportive treatment on the intensive therapy unit (ITU) continued. There was careful monitoring of all body functions. Haemodialysis (artificial kidney treatment) was added to help control metabolism and fluid balance, but there was no major deterioration of kidney function. The percentage of oxygen in inspired air is 20% when we breath normally. A much higher percentage was required to maintain adequate oxygenation of Chris’s blood, monitored continuously. Everything was stable for a few weeks. There was no healing of the lungs and no signs of recovery. With every day that passed without recovery, the probability of recovery diminished. After two months the probability of recovery was very low, but the possibility continued and this gave us all a slim hope. The family were realistic and aware that death was the most likely outcome. 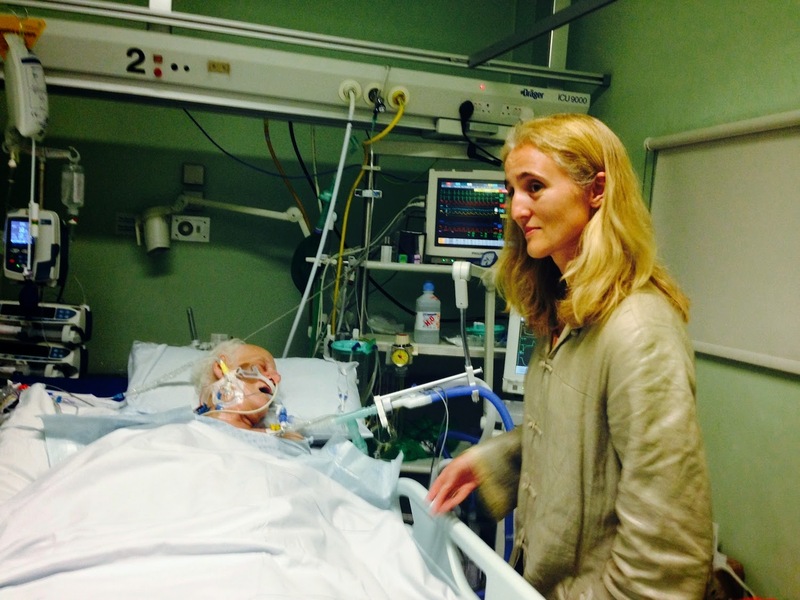 A breathing tube (ET tube) passed through the mouth demands that the patient is unconscious. 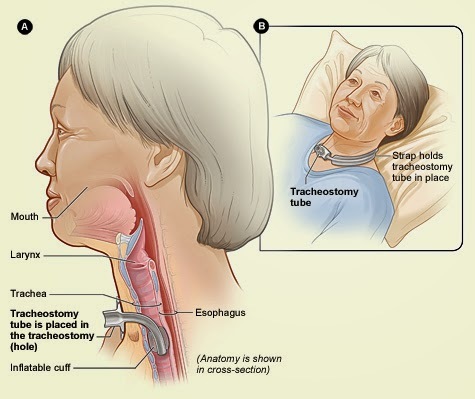 This is undesirable in the medium or long term and so after a couple of weeks with no recovery, the decision was made to create a tracheostomy. “-ostomy” means a hole, and so this meant making a hole in the trachea in the neck. This is a reversible process and it allowed a breathing tube to pass directly into the trachea rather than through the mouth. Chris remained stable, now ventilated via the tracheostomy. It was at this stage possible to reduce and stop the sedation to allow consciousness to return. This turned out to be a very slow and incomplete process but of course Chris was still paralysed and was therefore unable to respond to indicate understanding of what was said to him. The paralysing medications were also stopped. But Chris was very weak. Feeding had been via naso-gastric tube but there were limits of what his intestine could absorb. His muscles were very weak. His arms and legs were also swollen with fluid and thus very heavy. Because of the tracheostomy tube he was not able to speak, but he indicated that he wanted a pen and paper. Unfortunately he did not have the strength to hold the pen. We were uncertain as to his level of understanding. Much time had passed and it was now almost two months since the operation, which itself had gone well and there was full healing of the knee. It was clear that the lungs had not healed back to normal. It was a bit like a burn. Most burns will heal with restoration of normal skin. However severe deep burns cannot heal in this was but heal by fibrosis - dense scar tissue. And so it was with Chris’s lungs: they had “healed” by severe scaring and would not be able to function normally. There were two main results of severe lung damage. First, a high oxygen concentration of inspired air had to be maintained. Second, it had to be pumped into the lungs at high pressure, and this would be damaging. In normal breathing we develop a negative pressure within the chest by muscular effort and so air is sucked in through the mouth and trachea. This was achieved by the “iron lung” that was developed in the 1950s to ventilate patients paralysed as a result of poliomyelitis. This was a large device and so the smaller positive pressure systems were developed later and are in use now. Chris’s lungs were fibrosed and thus they were very stiff. This meant that the air pressure necessary to inflate the lungs had to be very high. This is dangerous over a long period of time but it turned out not to be possible to reduce the inflation pressure and at the same time maintain adequate oxygenation. The feared complication happened: the lungs “popped” - technically called a pneumothorax. The result was that air escaped through the surface of the lungs, through one or more small holes. Normally the lung then collapses to virtually nothing but this could not happen with Chris. 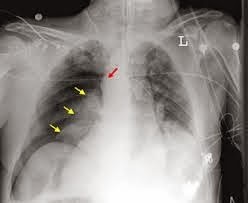 The stiff fibrosed lungs could not collapse but the pneumothorax was visible on X-ray and CT scan. Air escaping from the lungs, under positive pressure, tracked upwards into the neck, and then into the face. The loosest tissues in the face are in the orbits and this was where the air became most obvious. The eyelids were very puffy and the eyes therefore closed. The air could readily be pressed away but it returned almost immediately. Air in the skin is called “surgical emphysema”. This made communication with Chris even more difficult. His overall condition was starting to deteriorate. The blood pressure was stating to fall and could no longer be brought back to normal by intravenous medications. His precarious conscious level also deteriorated. The severely damaged and diseased lungs were not compatible with life. Chris’s heart was now failing. This continued during the next two days and he then died peacefully. Margaret was at his bedside, as she had been throughout so many hours of his illness. I have not yet discussed the cause of all this. I have mentioned that blood clot pulmonary embolus been excluded on CT scan. The next relatively common occurrence causing respiratory problems in the post-operative patient is pneumonia. The usual feature of this is cough productive of sputum but Chris had only a dry cough before he went to ITU. No micro-organisms were cultured from the tiny sputum sample that he was able to produce. He was given a wide range of antibiotics intravenously in high dose but there was not a sign of response or improvement. The clinical and CT scan appearances were not those of pneumonia. One of the ways in which the severity of illness can be assessed is by the use of inflammatory marks. The first of these is the ESR (erythrocyte sedimentation rate). This is non-specific and is elevated when inflammatory proteins are present in the blood. Another, in widespread use, is the CRP, C-reactive protein. This measures an inflammatory protein, normally less than 10mg/L. In mild infections it can rise to about 40mg/l. In respect of Chris the CRP had risen to 200mg/L. There was clearly a serious inflammatory process within his body. But the CRP elevation is non-specific and does not give information about the nature or cause of the inflammation. In general terms it can be the result of infection, malignancy, or other inflammatory disease, sometimes chronic auto-immune disease, or perhaps an allergic reaction. Tests of infection had been negative, Chris had an acute illness, not chronic. An allergic type of reaction had to be considered. It is usual in sick patients in a hospital to measure the systemic blood pressure regularly or continuously. The "systemic" blood pressure is what we usual understand as blood pressure, and it is measured in the arteries. An additional monitoring processes in the critically ill patient is the continuous measurement of the pressure of blood in the jugular veins in the neck, this representing the blood pressure in the right side of the heart, and it is usually low. This pressure in Chris was high. An echocardiogram (ultrasound of the heart) demonstrated pressure-induced dilatation of the jugular and other veins, and also the right atrium and right ventricle of the heart. This is called "pulmonary hypertension, a high blood pressure in the pulmonary arteries backing up into the right side of the heart. The back pressure in the major veins would interfere with function the the liver and kidneys, but not critically. It was clear that blood was not able to pass though the small arteries and capillaries within the lung (pulmonary blood vessels) and the inference was that they were damaged. In the absence of blood clot this was assumed to be an inflammatory reaction. But a reaction to what? In 2012 more than 22,000 hip replacements were performed in the UK following fracture of the "hip", technically the neck of the femur. There is a national registry and it was reported that between 2005 and 2012 41 patients died during or immediately after surgery for this condition (peri-operative deaths), with a further 21 suffering from cardio-pulmonary arrest from which they were successfully resuscitated (see Reference 1). This represents an average of six deaths per year, a risk of about 1 in 3,500. 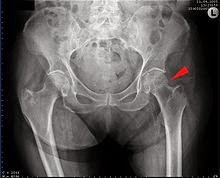 A fracture of the hip that necessitates a hip replacement is usually in the very elderly. The operation is usually performed a day or two after the event, when the clinical condition of the patient has been stabilised. 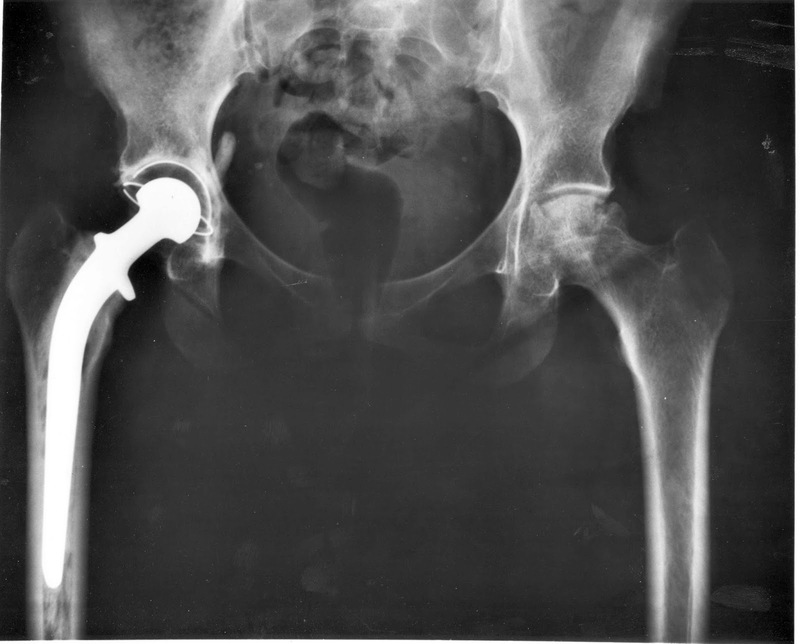 Right hip replacement - note long length of stem of prosthesis in the bone marrow. The left hip is very arthritic. However most hip replacements are elective, performed from a waiting list, the patients having suffered pain and restriction of mobility as the result of osteo-arthritis. At present a total of about 90,000 hip replacements are performed each year in the UK, in about 400 hospitals (UK National Joint Registry web-site). The overall peri-operative death rate is not clear but it is suggested that the death rate at 30 days is 0.3% (see Reference 2), a risk of about 1 in 300. This equates to 300 deaths per year nationally. This will involve a number of factors relating to existing frailty and illnesses of the patients (co-morbidities). The study citing this 30 day mortality rate made no mention of specific peri-operative deaths. The peri-operative death rate in hip replacement for fracture is 1 in 3,500 (see above), but it is is likely to be lower following elective surgery, perhaps 1 in 10,000. This would equate to 9 deaths per year nationally. Each of the 400 hospitals undertaking hip replacement surgery would expect to see a such a peri-operative death once every 45 years. Experience is thus very limited. It is thought that peri-operative deaths are the result of bone cement implantation syndrome (BCIS). There have been headlines such as “killer cement” (Daily Mail, 12 June 2014), but it is not quite as simple as this. When an artificial (prosthetic) joint is inserted it is usual to use a rapidly-setting adhesive glue or cement to fix it in place. The cement has obviously been tested for safety. As the cement sets very quickly it must injected rapidly into the marrow cavity of the bone into which the prosthesis is inserted. This is the femur in respect of hip replacement and we can from the figure the distance into which the prosthesis can extend into the bone marrow. It is known that quite frequently during the cement injection, the pressure of injection forces some fat out of the bone marrow into the blood stream (fat embolism). This can be detected by trans-oesophageal echocardiogram recorded during the operation. Usually it does no harm. However it is thought that this is the cause of sudden death during the operation or perhaps a few hours later. This is “fat embolism syndrome”. It means that the fat enters the blood stream from the bone marrow and passes though the inferior vena cava into the right side of the heart, then into the pulmonary artery, the pulmonary circulation. One purpose of the lung circulation is to remove particulate substances from the blood, and this will include fat. Although this usually causes no problem, in a few patients it causes the an intense inflammatory reaction and it is this that causes death. There is something special and indefinable about such patients. It is like an individual having serious peanut allergy and dying suddenly after taking just a tiny amount of peanut. There is general principle here concerning the body reaction to nuts, penicillin and other medicines, and perhaps fat. A toxic reaction, what we might call poisoning, affects all people, and the effect is proportional to the dose - the more given the worse the reaction. An allergic reaction affects only a few people, and a small dose is just as damaging as a large dose. It is sometimes described as an idiosyncrasy, meaning that there is something unusual about the people affected, something about their immune status that is usually not understood. So in fat embolism syndrome (FES) few people are affected and just a small amount of fat entering the lungs will cause a massive and often fatal inflammatory reaction. This type of immediate allergic reaction is sometimes called anaphylaxis. Allergic reactions can however be delayed by hours or days, as is usual with rashes due to penicillin and other medications. At present in the UK about the same number of knee replacements are performed as hip replacements, about 90,000 per year. The 30 day death rate is slightly less than with hip replacement, perhaps because the procedure is not undertaken as an emergency and the patients are selected to be fit with minimal risk. 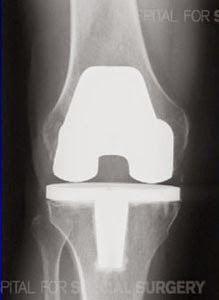 There are just a few case reports of fat embolism / bone cement implantation syndrome following knee replacement. Peri-operative deaths appear to very few, the risk possibly being as low as 1 in 100,000 This means one each year nationally, meaning that in 2014 Chris might have been the only person in the UK to have died in this way. It also means that each of the 400 hospitals will see such an occurrence on average every 400 years!. There are good reasons why BCIS should be less common following knee replacement compared to hip replacement. 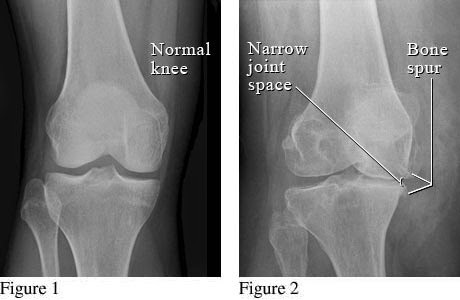 First, as can be seen from the X-ray images, the knee prosthesis extends a much shorter distance into the bone marrow and so there is much less disturbance of the fat within in it. Second, knee replacement tends to be undertaken with the use of a tight tourniquet situated around the thigh. The purpose of this is to restrict blood flow into the lower part of the knee so as to minimise the blood in the operating area and to minimise blood loss. The tourniquet would obstruct the veins leading from the knee and thus minimise the chance of fat from the bone marrow entering the blood-stream. A very detailed autopsy was performed following Chris’s death. The orthopaedic surgeon and the intensive care consultants were anxious for answers as they had been so concerned and puzzled during his illness. Chris's wife Margaret was also anxious for answers. The autopsy demonstrated severely damaged lungs, what is referred to as “end-stage” disease. There was no hint of healing by restoration of normal lung tissue, just extensive fibrosis / scarring. There was no fat seen in the lung tissue, but this is not important as the autopsy was more than two months after the initial event. The nature of the initial damage could not be identified. There was nothing unexpected found at the autopsy and it was effectively inconclusive. The view from the intensive care doctors (one of whom wrote the death certificate) was based on their experience of dealing with “intensive care patients”. A high proportion of these have “sepsis”, meaning serious infection and often pneumonia, that is lung infection. Common things are commonest and their viewpoint is understandable. In reality although there was a high level of inflammation in the lungs there was no supportive evidence of infection, or sepsis. Probability is based on the population being considered. If we move from the “intensive care patients” to “fit men who become very ill and die soon after knee replacement”, then the probability changes and “sepsis” becomes much less likely. The cause of death would have been better recorded as “Severe lung inflammation”, but that might be a term not on the coroner’s list and therefore not acceptable. “Multi-organ failure” is not a particularly useful term. It is an inevitable sequence of events in someone who is dying slowly whilst being being ventilated artificially. Could Chris have died from FES / BCIS ? The cause of Chris’s illness and ultimately death was far from clear during final days. There was severe lung inflammatory damage but its cause was uncertain. There was no blood clot pulmonary embolus of significance. The picture was not that of pneumonia and there had been no response to antibiotics. We are left with the strong suspicion that the cause of illness and death was BCIS and FES. In a recent study of peri-operative deaths following hip replacement surgery, performed as an emergency following fracture neck of femur, there were four intra-operative deaths (those occurring “on the table”) and two deaths within nine hours of the operation. It was only in those who died during surgery that fat could be identified in the lungs at autopsy (see Reference 3). It is likely that fat can be cleared from the lungs very rapidly, the lungs being metabolically very active. As mentioned, it is the resulting intense inflammatory reaction occurring in a few individuals that causes death. Chris was fit and healthy before surgery. Although we cannot be conclusive about the cause of his illness and death it is certain that it was something exceptionally rare, something that the staff had never seen previously. I believe that the most likely diagnosis, rare as it is, is fat embolism as part of bone marrow implantation syndrome. The view was that as BCIS is so rare after knee replacement, then it was most unlikely to be “the diagnosis”. The point is that if the death itself is an exceptionally rare event in this circumstance, then its cause must also be something exceptionally rare. The exceptional rarity of it, as mentioned above perhaps one death per year in the UK, means that no individual surgeon or hospital will have experience of it. A "series" study cannot and has not been possible. If such a rare death is recorded as "pneumonia" or "sepsis", then collective knowledge of it will not occur and learning will not take place. Chris was a man of high intellect, a retired civil engineer and transport planner. He was a great problem solver, an excellent player of Scrabble. We had to solve all the riddles from inside Christmas Crackers, and he would always try to finish incomplete crossword puzzles. He would have been fascinated to work out the nature of his illness and the cause of his death. He would be disappointed if there were to be no learning to come from it. Chris’s death was unexpected and sad. He left behind many good memories of him and a fairly large family of whom he was very proud. They were all very proud of Chris, a good husband, father and Grandpa. Rutter PD, Panesar SS, Donaldson LJ. What is the risk of death or severe harm due to bone cement implantation syndrome among patients undergoing hip hemiarthroplasty for fractured neck of femur? A patient safety surveillance study. Berstock JR, Beswisk D, Lenguerrand E, Whitehouse MR.
Mortality after total hip replacement surgery: a systematic review. de Froidment S, Bonetti LR, Villaverde RV, delMar Lests M, Palmiere C.
Postmortem findings in bone cement implantation syndrome-related deaths. Americal Journal of Forensic medicine and Pathology 2014; 35: 206-211.